I love going to Quilt Market. 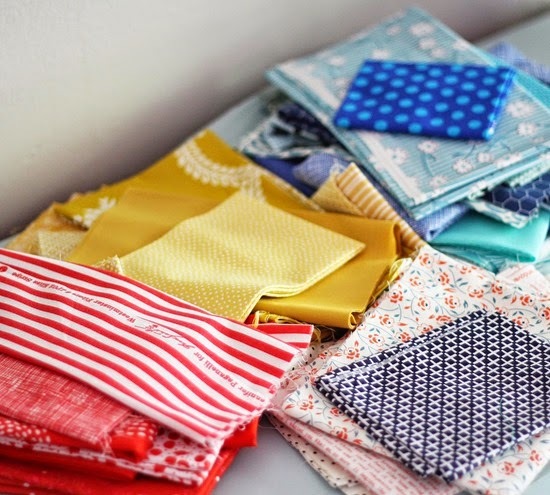 The isles of new fabric, stacks of pre-cuts, and inspiration are pretty awesome…but also leave me craving some individuality by the time I get home. I take a week or so away from my machine wondering what the heck I’m doing…and what I really like. Not what the industry and social media want me to like…but what I like. I have a hard time silencing that voice in my head (hello Instagram and Pinterest!) telling me what is a must make or what fabric I should be buying and sewing with right now. Luckily all it takes is pulling fabric and taking time cutting, and stacking, and re-arranging for me to figure it out what I love to make, and what makes it original. So there you go…that’s my deep thought for the year(s). And also, remind me why I put my design wall (if you could call it that!) within reach of my 2 year old? On the upside it’s kept her busy and it’s pretty fun to watch her re-arrange. I know what you mean. It seems all I saw posted was c+ s! I wanted to see other stuff too. Like thread, patterns, notions, you! I love that pattern (and the colors)! Tutorial? So lovely! Can you share how you made the blocks in the 2nd picture? The HSTs with a mitered border on two sides? I'm loving this new design on your wall, any chance it will be a new pattern? Your "thought for the year" makes one contemplate. Also, I like the quilt design you have going. As for childproofing the design wall, I think it'd have to be on the ceiling if you really wanted to succeed in that aim. How you'd reach it yourself, I don't know. At least your daughter isn't like my one year-old who has taken to grabbing up blocks and dumping them, and anything else she gets her hands on, in the bathroom trash can. Yep, the one I just emptied the vacuum into. Oh, and your design looks great, btw! Those blocks are terrific. Hope we see a pattern in the near future. Your daughter's help is priceless! Your thought for the year is a good one! Sometimes I find I'm much more creative when I'm not constantly looking at others creativity! Love the shot of your 2 yr old at the wall. Thankfully mine hasn't discovered it yet. The 5 yr old LOVEs it though! You have such an eye for color & design! Nobody else has to tell you what you should make or buy. 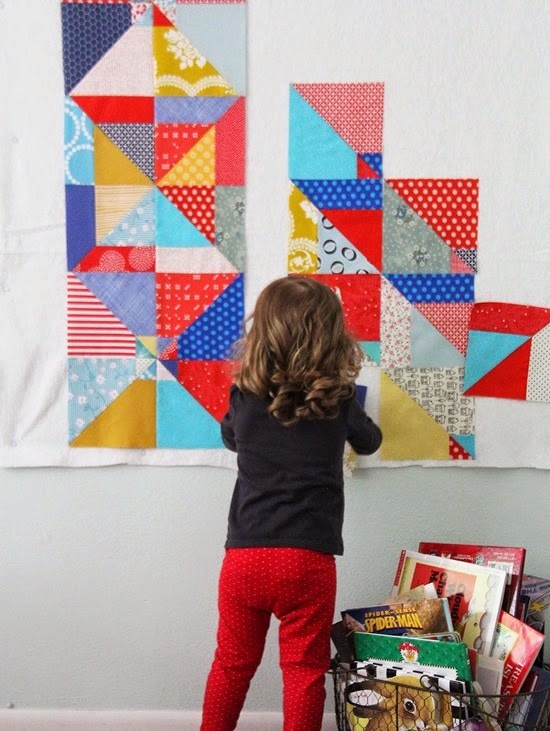 :) Looks like you have a quilter & fabric designer in the making! Love her sweet curls. I love so much of what you do – color, style and design. I cannot wait for your new line, Clementine to hit the shelves! It is so cute! I plan on buying my share… :) Good designing! My 4 year old loves to "design" on my design wall. I figure that it is good fun that usually does create too much of a mess so I let her. It was so nice to get to chat with you- hope we get to do it again. Uh, two year old? I remember finding your blog and you had a newborn! I am excited to see this quilt finished. 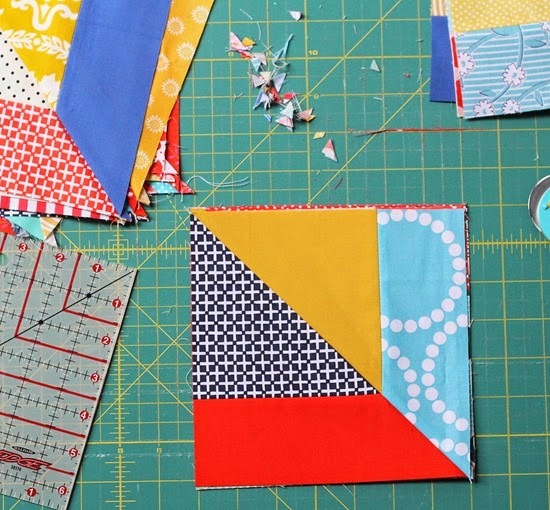 I am making a quilt from one of your tutorials right now. Just finished cutting it all out. For a charity event. I will make sure I send a pic when it is together. Thanks for the originality. Is what drew me to quilting to begin with. Nice to see a future quilter in your daughter! Thank goodness – a voice of reason! Although I enjoyed looking at all the Quilt Market photos, after about the fourth blog they all started to run together and look alike and I was bored out of mind cause I felt everyone was telling me, "these are the fabrics you must own; these are the patterns you must quilt." I'm a big girl, I can decide for myself. Part of the reason I quilt is the creative aspect if it. Thanks for offering a good, solid "eye-candy" read. Looks like she's a budding designer! Good for you, staying true to yourself! I so agree with you about what to make ~ I get so irritated about it all sometimes. What's modern, what's traditional and who cares anyway? I'm going to make what I like and that's it! Sorry, that was a bit of a rant, but I feel better now! Now that's my kind of helper!!! Oh in your book basket, Cloudy with a Chance of Meatballs, a big favorite of my children!! Mine too!! Always made us hungry for pancakes! Your colors inspire a "summer feel" to me, I think they remind me of a tablecloth on my grandmothers table when I was a young'un! Oh that is fantastic she is so helpful! I keep one low in my studio with orphaned blocks so my grand kids can arrange them as they like. Every once in a while the blocks get sewn into a doll blanket! 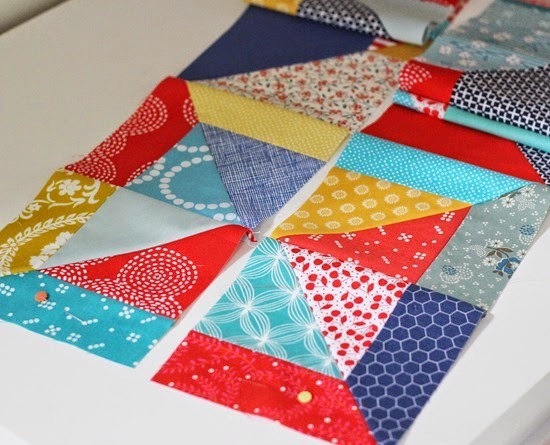 What pattern is the quilt you are working on? Yep, it always goes back to what I like and want to do. We have to be true to ourselves. About the design wall: so you can find out what SHE likes! Un treball molt bonic. I la teva filla t'ajuda molt jajaja !!! Hi. I usually don't comment. I am one of your lurkers. LOL. Although I get your posts in my inbox. I had to comment because you gave me a great idea. I love that your design wall is toddler friendly. I am going to put one on my classroom wall in the fall. What a great way to reinforce colors and shapes! Thank so much for the idea. Do you mind if I use your pick so I can write about it? I love it whenever a blogger acknowledges the fabric industry and its need to drive sales rather than encourage creativity. Makes me sad to think of people buying more and more fabric because it is 'must have', then moving on to buying the next fashion fabric before they've even had time to use what they once loved so much and had great dreams of using. I'm a newish quilter and I spend a lot of time on the Internet while breastfeeding (I have more time to read blogs, look at Pinterest, Flickr etc than to sew, sadly), I can feel it happening to me and I'm trying to resist the corporate machine and the online inspiration overload! I really like that quilt you're working on and look forward to seeing more of it. I've resisted going to even small shows because, although I know I'd get great ideas, the probability of sensory overload kind of scares me. I don't know how you 'see' an individual quilt or fabric with so much around it and after you've seen so much else. Your perspective confirms my thinking. I agree! So much stuff to appreciate. Sometimes too much. Very well said. I want to have my son design the next quilt I make for him like that. Let him pick fabrics and shapes and then he can arrange them for me to sew. Maybe that's what your daughter is up to! Is she a Member of Future Quilters of America yet? I have to say she is super cute! Those blocks are super fun! And no matter how much the world tells you what you *should* make, you are too creative to not be yourself. Love Every Word!!! And your little girl is growing up so quick :) Adorable!! I really like that pattern and your colors are just what I would use. Is that one of your paterns? I understand about doing what I like and using what I like. I'm not one to use a quilt with mostly white while others like the look. I like the color in my quilts. That's why I have boxes and boxes of fabric. Colors are amazing. And sometimes we need to clear our mind of everything to start being creative again. Love the colors on the design wall and love the kid-friendly wall. I have a pile of fabric in my stash from past years. I buy what I like, sometimes I worry that the color schemes may be dated, but they can recombine in new ways! I love that your assistant created a new pattern on your design wall. Always interesting to see what children can create. Yes. Thanks for putting into words what I've been feeling lately. I think I'm finally getting better and just liking what I like and not what I am told to like. (Even though I sometimes still like some of that stuff too.) I'm also getting better at not feeling like I HAVE to buy new fabric. I'm purging what I doesn't inspire me anymore from my stash and playing with the fabric I've already got that does inspire me. It's a good feeling. AMEN! Thanks for your words.